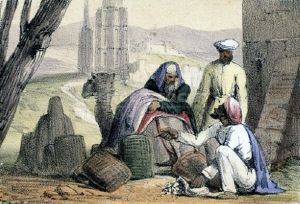 Cowry shells being used by an Arab trader. A currency is a unit of exchange, facilitating the transfer of goods and services. It is one form of money, where money is anything that serves as a medium of exchange, a store of value, and a standard of value. Historically, societies have developed currencies based on items considered valuable, such as shells, or cattle, to the use of precious metals first in forms such as ingots and later coins, and then to credit and paper money. Fiat money removes the concept of money as a commodity, guaranteeing that it has the value stated on it. There are also privately issued currencies that may be redeemed only by those who produce them. In most cases, each country has monopoly control over the supply and production of its own currency, usually through a central bank. Member countries of the European Union's Economic and Monetary Union are a notable exception to this rule, as they have ceded control of monetary policy to the European Central Bank and accept the Euro as their common currency. Although the United States dollar has been the de facto world currency, the possibility of developing an official world currency has come under discussion. Such a currency would be supported by a central bank for all transactions around the world, a step towards a more unified global society. Currency is used to facilitate trade by establishing standard values for items, removing the barrier of direct barter. In common usage, "currency" sometimes refers to only paper money, as in "coins and currency," but this is misleading. Coins and paper money are both forms of currency. A currency zone is a country or region in which a specific currency is the dominant medium of exchange. To facilitate trade between currency zones, there are exchange rates, which are the prices at which currencies (and the goods and services of individual currency zones) can be exchanged against each other. Currencies can be classified as either floating currencies or fixed currencies based on their exchange rate regime. In cases where a country has control of its own currency, that control is exercised either by a central bank or by a Ministry of Finance. In either case, the institution that has control of monetary policy is referred to as the monetary authority. Monetary authorities have varying degrees of autonomy from the governments that create them. In the United States, the Federal Reserve System operates without direct interference from the legislative or executive branches. It is important to note that a monetary authority is created and supported by its sponsoring government, so independence can be reduced or revoked by the legislative or executive authority that creates it. However, in practical terms, the revocation of authority is not likely. In almost all Western countries, the monetary authority is largely independent from the government. Several countries can use the same name, each for their own currency (such as Canadian dollars and United States dollars), several countries can use the same currency (such as the euro), or a country can declare the currency of another country to be legal tender. For example, Panama and El Salvador have declared United States currency to be legal tender, and from 1791-1857, Spanish silver coins were legal tender in the United States. At various times countries have either re-stamped foreign coins, or used currency board issuing one note of currency for each note of a foreign government held, as Ecuador currently does. The origin of currency is the creation of a circulating medium of exchange based on a unit of account which quickly becomes a store of value. Currency evolved from two basic innovations: the use of counters to assure that shipments arrived with the same goods that were shipped, and later with the use of silver ingots to represent stored value in the form of grain. Both of these developments had occurred by 2000 B.C.E.. Originally money was a form of receipting grain stored in temple granaries in ancient Egypt and Mesopotamia. This first stage of currency, where metals were used to represent stored value, and symbols to represent commodities, formed the basis of trade in the Fertile Crescent for over 1500 years. However, the collapse of the Near Eastern trading system pointed to a flaw: in an era where there was no place that was safe to store value, the value of a circulating medium could only be as sound as the forces that defended that store. Trade could only reach as far as the credibility of that military. By the late Bronze Age, however, a series of international treaties had established safe passage for merchants around the Eastern Mediterranean, spreading from Minoan Crete and Mycenae in the North West to Elam and Bahrein in the South East. 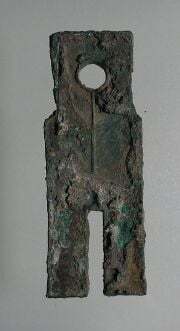 Although it is not known what functioned as a currency to facilitate these exchanges, it is thought that ox-hide shaped ingots of copper, produced in Cyprus may have functioned as a currency. It is thought that the increase in piracy and raiding associated with the Bronze Age collapse, possibly produced by the Peoples of the Sea, brought this trading system to an end. It was only with the recovery of Phoenician trade in the ninth and tenth centuries, that saw a return to prosperity, and the appearance of real coinage, possibly first in Anatolia with Croesus of Lydia and subsequently with the Greeks and Persians. In Africa many forms have been used including beads, ingots, ivory, various forms of weapons, livestock, the manilla currency, ochre and other earth oxides, and so on. The manilla rings of West Africa were one of the currencies used from the fifteenth century onwards to buy and sell slaves. African currency is still notable for its variety, and in many places various forms of barter still apply. 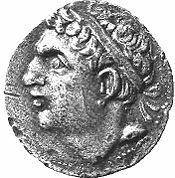 A coin showing Hasdrubal Barca, Hannibal's younger brother. These factors led to the shift of the store of value being the metal itself: at first silver, then both silver and gold. Metals were mined, weighed, and stamped into coins. This was to assure the individual taking the coin that he was getting a certain known weight of precious metal. Coins could be counterfeited, but they also created a new unit of account, which helped lead to banking. Archimedes' principle allowed the next development in currency to occur: coins could now be easily tested for their fine weight of metal, and thus the value of a coin could be determined, even if it had been shaved, debased or otherwise tampered with. In most major economies using coinage, copper, silver, and gold formed three tiers of coins. Gold coins were used for large purchases, payment of the military and backing of state activities. Silver coins were used for large, but common, transactions, and as a unit of account for taxes, dues, contracts and fealty, while copper coins represented the coinage of common transaction. This system had been used in ancient India since the time of the Mahajanapadas. In Europe, this system worked through the medieval period because there was virtually no new gold, silver, or copper introduced through mining or conquest. Thus the overall ratios of the three coinages remained roughly equivalent. In China, the need for credit and for circulating medium led to the introduction of paper money, commonly known today as banknotes. In Europe paper money was first introduced in Sweden in 1661. Sweden was rich in copper, thus, because of copper's low value, extraordinarily big coins (often weighing several kilograms) had to be made. Because the coin was so big, it was probably more convenient to carry a note stating your possession of such a coin than to carry the coin itself. Paper money was, in one sense, a return to the oldest form of currency: it represented a store of value backed by the credibility of the issuing authority. Drafts, letters of credit, and checks issued privately had been in intermittent use for centuries, however, it was with the rise of global trade that paper money would find a permanent place in currency. The advantages of paper currency were numerous: it reduced transport of gold and silver, and thus lowered the risks; it made loaning gold or silver at interest easier, since the specie (gold or silver) never left the possession of the lender until someone else redeemed the note; and it allowed for a division of currency into credit and specie backed forms. It enabled the sale of stock in joint stock companies, and the redemption of those shares in paper. However, these advantages held within them disadvantages. First, since a note has no intrinsic value, there was nothing to stop issuing authorities from printing more of it than they had specie to back it with. Second, because it created money that did not exist, it increased inflationary pressures, a fact observed by David Hume in the eighteenth century. The result is that paper money would often lead to an inflationary bubble, which could collapse if people began demanding hard money, causing the demand for paper notes to fall to zero. The printing of paper money was also associated with wars, and financing of wars, and therefore regarded as part of maintaining a standing army. For these reasons, paper currency was held in suspicion and hostility in Europe and America. It was also addictive, since the speculative profits of trade and capital creation were quite large. Major nations established mints to print money and mint coins, and branches of their treasury to collect taxes and hold gold and silver stock. With the creation of central banks, currency underwent several significant changes. During both the coinage and credit money eras the number of entities which had the ability to coin or print money was quite large. One could, literally, have "a license to print money"; many nobles had the right of coinage. Royal colonial companies, such as the Massachusetts Bay Company or the British East India Company could issue notes of credit—money backed by the promise to pay later, or exchangeable for payments owed to the company itself. This led to continual instability of the value of money. The exposure of coins to debasement and shaving, however, presented the same problem in another form: with each pair of hands a coin passed through, its value grew less. The solution which evolved beginning in the late eighteenth century and through the nineteenth century was the creation of a central monetary authority which had a virtual monopoly on issuing currency, and whose notes had to be accepted for "all debts public and private." The creation of a truly national currency, backed by the government's store of precious metals, and enforced by their military and governmental control over an area was, in its time, extremely controversial. Advocates of the old system of Free Banking repealed central banking laws, or slowed down the adoption of restrictions on local currency. At this time both silver and gold were considered legal tender, and accepted by governments for taxes. However, the instability in the ratio between the two grew over the course of the nineteenth century, with the increase both in supply of these metals, particularly silver, and of trade. This is called bimetallism and the attempt to create a bimetallic standard where both gold and silver backed currency remained in circulation occupied the efforts of inflationists. Governments at this point could use currency as an instrument of policy, printing paper currency such as the United States Greenback, to pay for military expenditures. They could also set the terms at which they would redeem notes for specie, by limiting the amount of purchase, or the minimum amount that could be redeemed. By 1900, most of the industrialized nations were on some form of gold standard, with paper notes and silver coins constituting the circulating medium. Governments too followed Gresham's Law: keeping gold and silver paid, but paying out in notes. A banknote (more commonly known as a bill in the United States and Canada) is commonly used as legal tender in many jurisdictions. With coins, banknotes make up the cash form of all modern money. Banknotes normally have no intrinsic value, that is the paper from which banknotes are made is worth very little if not in the form of a banknote. This is opposed to the idea of gold or silver coins, which have some intrinsic value. This eliminates the risk of carrying around precious metals and also eliminates the burden of carrying around large sums of heavy coins. 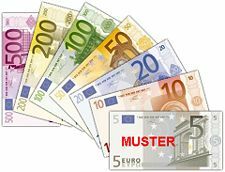 Most modern banknotes are fiat currency, or money that is backed by government demand as legal tender, meaning that note cannot be refused for repayment of a debt. Checks, credit cards, and debit cards are not usually considered legal tender, which is why certain stores do not accept one or any of those forms of payment. Fiat currency adds an essential level of stability to economic transactions as buyers and sellers do not have to doubt the value of the medium of exchange (namely the money). This allows transactions to occur based solely on the buyer's desire to buy and the seller's desire to sell and the value that each places on the good or service for sale rather than considering the outside factor of the medium of exchange. Fiat currency removes the concept of money as a commodity, which was the case when gold or silver was traded for items. From the earliest times token coins were issued by companies in remote parts of the world to overcome the shortage of circulating currency. Several large companies issue points to their customers, to be redeemed for products and services produced by that company. Often, a network of companies will join to share in the offering and redemption of points. While these can hardly be considered stable currency systems, they present many of the same features as "legitimate" currency: they are a store of value, issued in discrete units; they are controlled by a central issuing authority; and they have varying rates of exchange with other forms of currency. Casino token: Chips are used in wagering for various reasons—mostly to make it easier to recognize or count the amount of a wager by eye, or (as in roulette or craps) to distinguish wagers belonging to different players that by necessity must be played near each other. Alternative currency: A currency such as the Liberty Dollar that is intended to replace or compete with a national currency. Frequent flyer miles: A type of private currency, different versions of which are issued by most major airlines to encourage customer loyalty. Other customer loyalty incentives have followed this model, including points systems offered by many businesses. 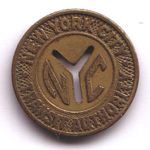 Subway tokens, issued by city transit authorities, can be considered a highly specialized form of currency. Digital public transport currency, stored on a smart card and sold in exchange of real money. Scrip: A type of private currency where a certain value is captured, and used to purchase goods from a company. Examples of scrip include gift certificates, gift cards, and Disney Dollars. However, scrip is not considered a currency in itself, but merely a store of value, denominated in another currency. Coupons: are a form of currency that is recognized by businesses, not to purchase a product or service, but to deduct from the total cost, promote benefits, rebates or discounts. Coupons are primarily used as a marketing tool. A cryptocurrency is a digital asset designed to work as a medium of exchange that uses strong cryptography to secure financial transactions, control the creation of additional units, and verify the transfer of assets. Cryptocurrencies are a kind of alternative currency and digital currency (of which virtual currency is a subset). Cryptocurrencies use decentralized control as opposed to centralized digital currency and central banking systems. The decentralized control of each cryptocurrency works through distributed ledger technology, typically a blockchain, that serves as a public financial transaction database. Bitcoin, first released as open-source software in 2009, is generally considered the first decentralized cryptocurrency. Since the release of bitcoin, over 4,000 altcoins (alternative variants of bitcoin, or other cryptocurrencies) have been created. 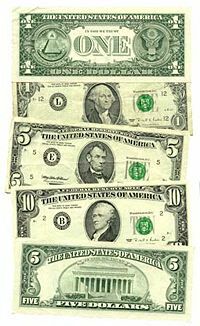 Images of various US dollars. In the foreign exchange market and international finance, a world currency or global currency refers to a currency in which the vast majority of international transactions take place and which serves as the world's primary reserve currency. Somewhere between 40 and 60 percent of international financial transactions are denominated in dollars. For decades the dollar has also been the world's principle reserve currency; in 1996, the dollar accounted for approximately two-thirds of the world's foreign exchange reserves. An alternative definition of a world or global currency refers to a hypothetical single global currency, which would be produced and supported by a central bank which is used for all transactions around the world, regardless of the nationality of the entities (individuals, corporations, governments, or other organizations) involved in the transaction. No such official currency currently exists for a variety of reasons, political and economic. Belgian economist Bernard Lietaer has proposed Terra as a possible "world currency," based on the idea in an article in the French newspaper Le Fédériste on January 1st 1933, which suggested the establishment of L'Europa – monnaie de la paix, (in English "Europe - Money of peace"). Eliminate speculation in Foreign exchange markets (Forex) since there is a need for a currency pair to speculate. Eliminate the balance of payments/current account problems of all countries. Eliminate the risk of currency failure and currency risk. Eliminate the uncertainty of changes in value due to exchange-caused fluctuations in currency value and the costs of hedging to protect against such fluctuations. Cause an increase in the value of assets for those countries currently afflicted with significant country risk. Eliminate the misalignment of currencies. Utilize the seigniorage benefit and control of printing money for the operations of the global central bank and for public benefit. Eliminate the need for countries or monetary unions to maintain international reserves of other currencies. ↑ Robert Gilpin, Global Political Economy: Understanding the International Economic Order (Orient Longman, 2003, ISBN 8125023062), 255. ↑ Bernard Lietaer, Das Geld der Zukunft (München, 2002, ISBN 3570500357). ↑ Why a Single Global Currency, Single Global Currency Association. Retrieved January 25, 2019. All links retrieved January 25, 2019. This page was last modified on 25 January 2019, at 23:00.